When you are buying or selling a home, you need to take floods into account for the purposes of securing a loan, securing insurance, and valuing a home. Floods or the potential for floods may dramatically affect the value of a home. During the underwriting process, a lender will look at flood insurance maps and flood risk, among other factors, when determining whether to provide a mortgage. Massachusetts makes fewer flood-related disaster declarations than some states. Even so, the need for flood insurance may affect you and should be taken into account when you are entering into a property transaction. At Pulgini & Norton, our experienced Boston real estate attorneys can help you incorporate information about floods into your expectations for a property transaction, and we can advise you on obtaining flood insurance. 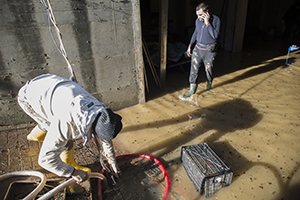 For many years, people who live in Massachusetts have dealt with local floods that have ruined or adversely affected their homes. In some cases, the damage is limited to the basement, but in other cases, there may be more substantial damage. The risk of injuries during flooding is high due to the possibility of electrified standing water. As someone buying a home, you need to be alert to both safety and financial considerations. Your homeowners' policy is unlikely to pay for flooding damage unless you purchase a special endorsement for this. Even when you buy a flood insurance policy, there may be restrictions on when and how coverage kicks in. You may also be eligible to get money from the Federal Emergency Management Agency (FEMA) in order to make specific repairs. If a flood does occur, you could be left with a seriously devalued property. This means that a lender could lose out financially if it does not research and handle the threat of this possibility appropriately. Under the Biggert-Waters Flood Insurance Act, subsidies were eliminated for the National Flood Insurance Program to reflect risk for many property owners. The law called for FEMA to redraw flood plain maps to include more homes. In 2014, homeowners living in flooded areas received some relief under a new law signed by President Obama, which capped flood insurance premium increases and allowed below-market rates to be passed on to people purchasing homes in flood zones. Many homeowners do need to obtain flood insurance, and the premiums may be higher than they may expect. Certain homeowners may be surprised to learn that their homes are now in a high-flood zone, whereas they were not before. All of this means that you may be required by the lender to buy flood insurance in connection with securing a mortgage. It is important to consider the cost of flood insurance when calculating whether you can afford a home as a buyer or for how much to list your home if you are a seller. Floods may be devastating, and it is important to give some consideration to them if you are buying or selling a home. If you are trying to decide how much your home is worth for the purposes of selling or buying, one consideration should be the cost and value of flood insurance. Pulgini & Norton's Boston real estate lawyers may be able to help you select insurance and negotiate with the other party to the transaction accordingly. Our firm represents buyers, sellers, associations, and lenders in Cambridge, Weymouth, and New Bedford, as well as other Massachusetts communities. Call us at 781-843-2200 or complete our online form for an appointment with a property transaction attorney.